Although the 2018 Dodge Challenger SRT Demon is yet to be released, reviews are starting to trickle down to the mainstream, including this one from motormag.com.au https://www.motormag.com.au/reviews/1707/2018-dodge-challenger-srt-demon-review which outlines some of the finer points of this incredible muscle car. The Demon is clearly meant for the track in its stripped out form, but that doesn’t mean it can’t be used on the roads, well in theory, as the limited numbers of 3,300 will probably mean most of these will sit as collectors items. However, the car itself is a testament to the modern muscle car world, showing that supercar/hyper specs. can be made for a fraction of the price as long as you buy into the muscle car world and accept its finer points. All the specs are here – the supercharged 6.2-litre HEMI V8 delivering 626 kW at 6,300rpm and 1044 Nm at 4500rpm with race fuel, Drag mode with the revolutionary air-conditioning to cool the engine air, upgraded hardware, Nitto NT05R 315/40R18 tires, lighter body weight than the Hellcat and firsts in many areas to name but a few. If you want the full rundown of the Dodge Demon and its specifications, check out some of our past articles which go into complete detail with this marvellous machine. But what is the outcome of this initial review? Is the Demon as good as the hype? Up to this point, it seems the answer is yes, at least from the review’s perspective with a car that is happy to go on the highway, but is most at home on the dragstrip. Releasing a modern-day muscle car which is optimised for the dragstrip, continues the ethos of muscle cars in general, taking a midpriced Dodge Challenger optimising it for the dragstrip, but now straight from the factory. The main takeaway is that the SRT Demon is a groundbreaking muscle car, which gives you hyper car figures for a fraction of the money and you still get the street cred. 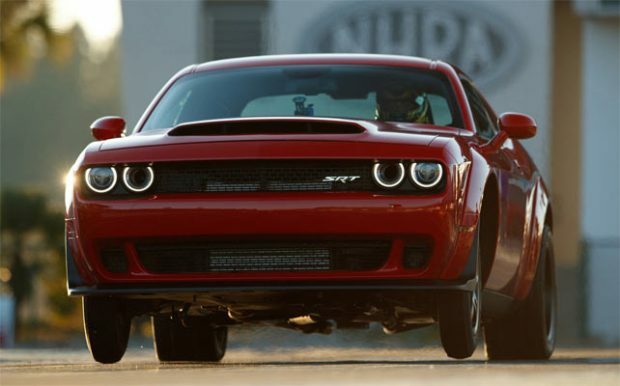 of owning the Dodge Challenger which can take on the best out there. Isn’t this just the continuation of the muscle car way?